In 1831, Teddington villagers appointed a committee to raise funds to build a new school for boys. Queen Adelaide donated £100 and granted an annual subscription of £5 to the new school. 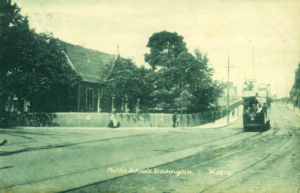 ‘Teddington Public School’ opened 30th January 1832, its first home being Victorian premises at the Broad Street end of Church Road, providing education for 41 boys. 1868 the school had expanded so new buildings were needed and in 1870 the Government announced that school attendance was compulsory. Numbers grew again in 1876 so a new infants school opened behind the original school buildings. 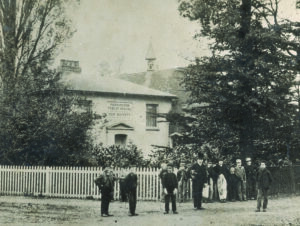 In 1906, the school name changed – an initial proposal was ‘Church Road School’ then ‘St. Mary’s’, it was finally agreed upon St. Mary’s and St. Peter’s. In 1929 the girls, boys and infants schools merged into two – the Infants and Juniors. 1932 saw the school celebrate its Centenary. During World War II the school incurred some damage to the due to the bombing of central Teddington. Classes were disrupted during these six years and some children were even evacuated to Wales. In 1974, a new school was built on a site between Church Road and Somerset Road. Formerly a whole street of Victorian houses and shops, the area was bombed in 1940 and greatly damaged by a V1 flying bomb in 1945. In 1975 St. Mary’s and St. Peter’s was officially re-opened by the Bishop of Kensington, Ronald Goodchild. The old school buildings were demolished and a new church, St Peter and St Paul was built. The old school’s red brick wall on Broad Street is all that survives. During 2000 – 2001, new buildings and an atrium were added to St. Mary’s and St. Peter’s CE Primary School as the school expanded to two forms of entry. In 2007, the school commenced celebrations of its 175th Anniversary or its ‘Terquasquicentennial’, making it the oldest surviving school in Teddington and one of the oldest schools in the London Borough of Richmond upon Thames. Finally, we have finished expanding the school to three forms of entry, as demand for school places continues to grow. This involved a major building and refurbishment project and now the school is well equipped to meet the needs of the local community and so continue its mission as a Church of England school in the heart of Teddington.